begins Sunday April 23 with a Free Kick-Off Play day at 3pm at Jaycee Park in Reidsville. Players must register by Sunday April 30 to continue to play in the 4-week match season. 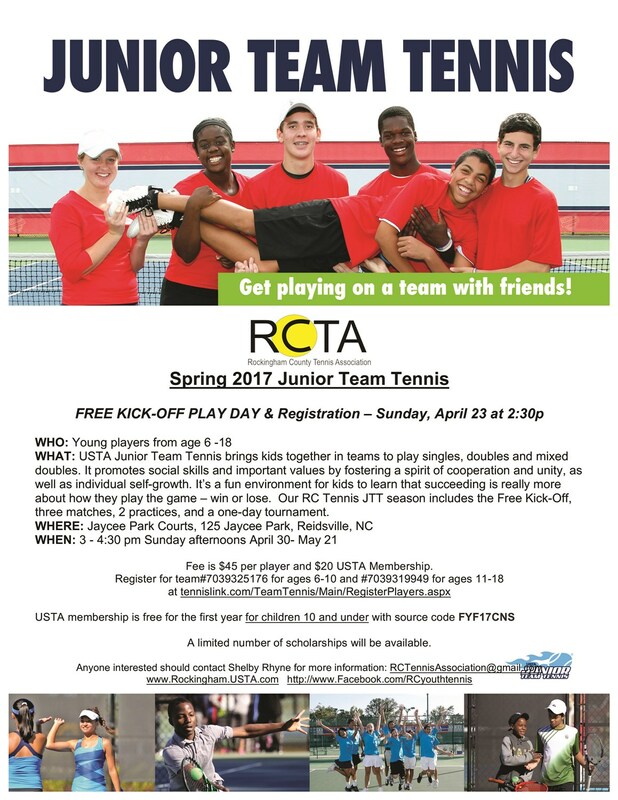 Matches are held on courts at Jaycee Park or Rockingham Community College in Reidsville on April 30, May 7, 14 and 21 from 3-4:30pm. Our match format for May 21 is a singles Level 6 USTA Junior round robin tournament followed by a team celebration. With your credit card and USTA member number, register online to play for team by clicking here. You may register by check or cash at the Play Day on April 23. The team registration fee is $45 per player and includes the May 21 tournament registration fee. We will have a limited number of scholarships for the team registration fee available based on need. Please contact Shelby Rhyne if you would like to apply. Click here . USTA youth membership is $20 per year and free for 10 and under players their first year.